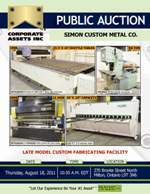 Corporate Assets Inc. | Simon Custom Metal Co. - Corporate Assets Inc. FEATURING: MITSUBISHI / TOYOKOKI (2000) HYB-12540 11 axis electro hydraulic press brake, MITSUBISHI (1998) ML3015LXP flying optic laser cutter, LVD (1990) HST 31/6 10' X .25" hydraulic shear, PIRANHA PII 88 hydraulic ironworker, BPR (1995) CP 30 angle bending rolls, TEZSAN (1996) SN 50 C 21/31” X 75” gap bed engine lathe, DARBERT MICROCUT vertical turret mill, (3) LINCOLN SQUAREWAVE TIG 225 TIG welders, (2) LINCOLN WIRE-MATIC 250 MIG welders, AKLANDS 135 MIG welder, MEMCO MEMCOMATIC 250 MIG welder, WEL-O-MATIC 15 KVA rocker arm spot welder, PROGRESS (1999) PNC158-5 stroke sander, KBC (1991) CS 10 table saw, YALE GLC080LGNGAE085 7400 lbs. LPG forklift, DODGE (2008) GRAND CARAVAN SE minivan, hand tools, power tools, pump truck, bench grinders, racking, ladders, conveyors, welding supplies, assorted raw material, office furniture etc.